PrecisionMRX™ Nanoparticle Production Process Ready | Manhattan Scientifics Inc.
"We are proud and excited to be production-ready with the most precise nanoparticles in the industry. While we can produce a range of particles from 5-30 nm, we are most happy to be producing the 25nm particles that enable the most sensitive detection by the MRX II instrument." Building upon local relationships, Senior Scientific is stepping into the commercial space with first product introductions through Azano Biotech. Azano currently supplies research reagents to the same cancer researchers who will eventually be customers for the MRX II instrument. Therefore, we are pleased to be making the PrecisionMRX Nanopartticles available for them to use is assays and applications that they will eventually want to quantify using our instrumentation. Azano is set up to take orders, package and distribute, as well as leverage existing relationships in the research community to whom we can introduce Precision MRX Nanoparticles. 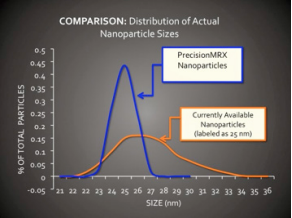 PrecisionMRX Nanoparticles: What does "Precision" mean? PrecisionMRX Nanoparticles are made of Magnetite, a type of iron oxide that exhibits unique magnetic properties at the nanoscale, also termed "superparamagnetism." Superparamagnetic magnetite nanoparticles are produced by a number of suppliers and have found utility in many industrial and biomedical applications. Most suppliers report the size of their nanoparticles based on Transmission Electron Microscopy (TEM). Generally, 1000 particles or less are selected for measurement by the technician, so this technique is not only subjective, but doesn't provide a good statistical representation of the true sample quality. Senior Scientific uses a far more accurate and statistically robust measurement technique called Small Angle X-ray Scattering (SAXS). SAXS samples many millions of particles and provides a much more statistically accurate value of the "size dispersity," or how uniform the particle sizes are. Our nanoparticles consistently have a size dispersity close to 5%, which is considered "uniform" by the National Institute of Standards and Technology (NIST). Erika Vreeland is our most recent addition to the Senior Scientific team. Erika is a newly minted PhD in Chemical Engineering who graduated with honors from the University of New Mexico with a particular focus on iron oxide nanoparticles synthesis. She perfected her synthesis and analytical skills during her PhD research at Sandia National Laboratories and the Center for Integrated Nanotechnologies (CINT). Over 1.6 million breast biopsies are conducted annually in the US and over 80% of these are negative for breast cancer. That means almost 1.3 million women are getting unnecessary invasive and painful procedures each year. Senior Scientific's MRX technology represents a method that could one day replace this procedure with a sensitive and specific way to map the presence of cancerous breast cancer cells by targeting specific antibody conjugated nanoparticles and measuring with the MRX II instrument. Conjugation of Her2 positive breast cancer antibodies with Precision MRX Nanoparticles is underway. Animal proof of concept is the next step in the process to prepare for a clinical trial. Clinical study designs are being discussed with several research teams that could help establish the accuracy and sensitivity of MRX detection for mapping existing breast lesions, with the intention of avoiding not only painful biopsies, but also unnecessary surgeries.